PAHOA, Hawaii — Authorities were racing Tuesday to close off production wells at an Israeli-owned geothermal plant threatened by a lava flow from Kilauea volcano on Hawaii’s Big Island. Workers were capping the 11th and last well at the plant to prevent toxic gases from wafting out after lava entered, then stalled, on the property near one of the new volcanic vents. “Right now, they’re in a safe state,” Mike Kaleikini, senior director of Hawaii affairs for the Puna Geothermal Venture plant, said of the wells. There also were plans to install metal plugs in the wells as an additional stopgap measure. The wells run as far as 8,000 feet (2,438 meters) underground at the plant, which covers around 40 acres (16 hectares) of the 815-acre (329.8 hectare) property. The plant has capacity to produce 38 megawatts of electricity, providing roughly one-quarter of the Big Island’s daily energy demand. Lava destroyed a building near the plant, bringing the total number of structures destroyed in the past several weeks to nearly 50, including dozens of homes. The latest was a warehouse adjacent to the Puna plant, overtaken by lava on Monday night, Hawaii County spokeswoman Janet Snyder told the Honolulu Star-Advertiser. The building was owned by the state of Hawaii, and was used in geothermal research projects in the early days of the site. Puna Geothermal, owned by Ormat Technologies, was shut down shortly after Kilauea began spewing lava on May 3. The plant harnesses heat and steam from the earth’s core to spin turbines to generate power. A flammable gas called pentane is used as part of the process, though officials earlier this month removed 50,000 gallons (190,000 liters) of the gas from the plant to reduce the chance of explosions. Founded in Yavne, Israel, Ormat is today headquartered in Nevada. Its main manufacturing facilities remain in Israel. Native Hawaiians have long expressed frustration with the plant since it came online in 1989; they believe is built on sacred land. Goddess of fire, Pele, is believed to live on Kilauea volcano, and the plant itself is thought to desecrate her name. Other residents have voiced concerns over health and safety. Scientists, however, say the conditions on Kilauea make it a good site for harnessing the earth for renewable energy. Geothermal energy is also considered a clean resource as it doesn’t generate greenhouse gas emissions, said Bridget Ayling, the director of Nevada’s Great Basin Center for Geothermal Energy. 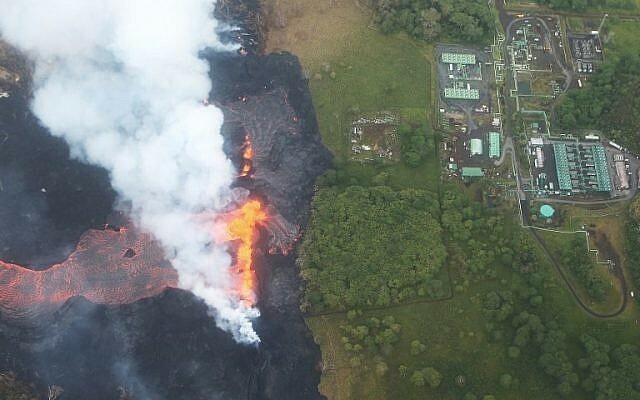 Ormat said in a May 15 statement that there was a low risk of surface lava making its way to the facility. The company also said there was no damage to the facilities above-ground and that it was continuing to assess the impact. The plant is expected to begin operating “as soon as it is safe to do so,” according to the statement. Puna Geothermal represents about 4.5 percent of Ormat’s worldwide generating capacity. Last year, the Hawaii plant generated about $11 million of net income for the company. Ormat is traded on the New York and Tel Aviv stock exchange, and shares have fallen nearly 10 percent since Kilauea began erupting. Scientists say lava from Kilauea is causing explosions as it enters the ocean, which can look like fireworks. 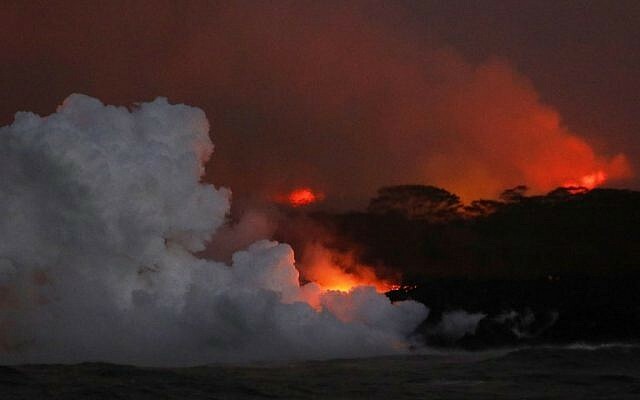 When lava hits the sea and cools, it breaks apart and sends fragments flying into the air, which could land on boats in the water, said US Geological Survey scientist Wendy Stovall. Kilauea sparked new safety warnings on Monday about toxic gas on the Big Island’s southern coastline after lava flowing into the ocean set off a chemical reaction. Large steam plumes created lava haze, or “laze,” laced with hydrochloric acid and fine glass shards when it flowed into the sea. It’s just the latest hazard from a weeks-old eruption that has so far generated earthquakes and featured gushing molten rock, giant ash plumes and sulfur dioxide. 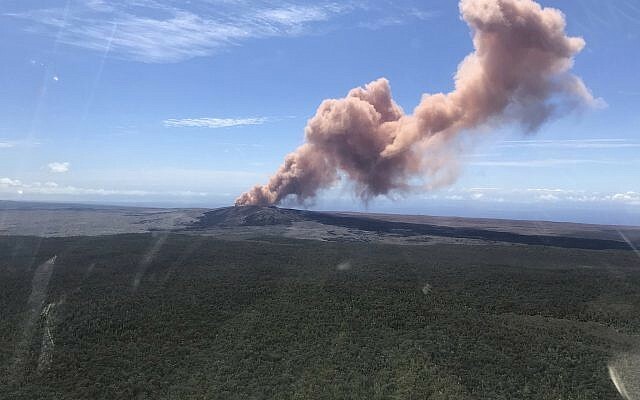 There has been continuous low-level ash emission from Kilauea’s summit with larger explosions every few hours, said U.S. Geological Survey geophysicist Mike Poland.